If the US can update its nuclear weapons strategy for the first time since 2010 and can develop its latest nuclear weapons, the Russians can do so too. Russian President Vladimir Putin dusted up the cold-war era arms race with the US on Thursday, making an aggressive presentation of new nuclear missiles that render the US defense shields worthless. He said the new weapons in the making will force the US into accepting that Russia is no longer an inferior power surrounded by the strategic missile defense systems of the US and its Nato allies. In essence, the mini nukes Putin has vowed to develop and deploy are the re-incarnation of the Project Pluto the US rolled out in the 1960s and was dumped midway through. Both the cold war rivals had invested time and energy in developing mini nuclear reactors that can be fitted on missiles or bomber aircraft. The US had also gone ahead with a nuclear-powered missile project, the Supersonic Low Altitude Missile (SLAM). Now, Russia has come back to work on similar projects and Putin says he has made headway. Putin's election-eve rhetoric, however, did not lack a searing context. In February the Pentagon, in its Nuclear Posture Review, proposed building new, smaller low-yield atomic bombs to counter Russia. If the US can update its nuclear weapons strategy for the first time since 2010 and can develop its latest nuclear weapons, the Russians can do so too. The Russian establishment decried the use of 'arms race' in the reporting of Putin's address but the fact remains that the top two military powers are indeed in the race. As some commentators pointed out, with Trump spending less resources on diplomacy and more on weapons, Russia could only follow suit. Among the new weapons he presented were missiles that put the warhead into low-earth orbit and a new Intercontinental Ballistic Missile (ICBM) that reaches US territory from Russia via a South Pole route. The new long range nuclear tipped missile codenamed Sarmat (RS-28) will alter the current military balance with the US, Putin claimed. The US has an array of interceptor missiles in Alaska as a pre-emptive move against a Russian attack. However, the new Russian projectiles will be capable of launching attack from any direction. Putin also accused the US of starting an arms race by deploying missile-defense systems around Russia and its allies. He said Russia will retaliate immediately if the US launches a nuclear strike on any of its allies, without naming the allies in this category. "It is my duty to state this: Any use of nuclear weapons against Russia or its allies, be it small-scale, medium-scale or any other scale, will be treated as a nuclear attack on our country. The response will be instant and with all the relevant consequences," Putin said. Putin used his election-eve address to declare that he has revived a weapons technology dumped long back in the dungeons of the cold war era nuclear propulsion missiles. The Russian leader claimed that the nuclear-propelled cruise missile was successfully tested at the end of 2017 and that a new series of weapons is being built on the basis of this technology, the Russia Today reported. Russia also successfully tested an underwater, nuclear-powered drone too in December, Putin said. What Russia aims to build is a "strategic complex of nuclear arms with rockets fitted with a nuclear-propulsion engine," Putin said. 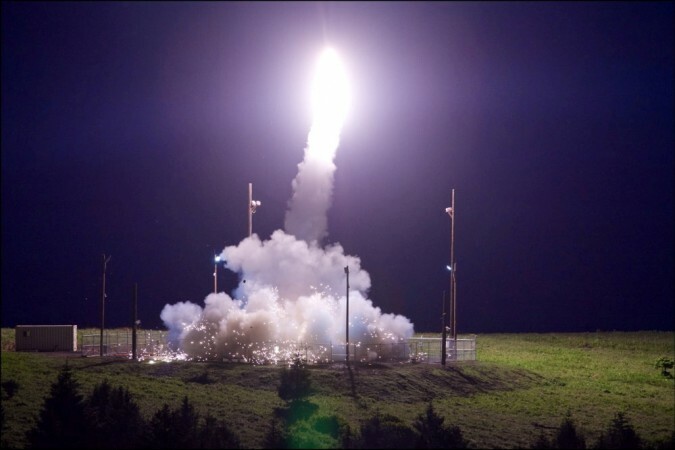 The US missile defense systems were the creation of the cold war era and it was need to defend itself against a Russian missile attack. But after the collapse of the USSR, the US moved its Aegis missile defense systems to the Russian backyards of Romania and Poland, something that has remained as a festering wound on the Russian side. Russia was also angered when the US dumped the Obama era philosophy of arms reduction earlier last month and said it was developing new nuclear weapons including low-yield nukes that can be fitted on submarine launched ballistic missiles. "As part of our defense, we must modernize and rebuild our nuclear arsenal, hopefully never having to use it, but making it so strong and so powerful that it will deter any acts of aggression by any other nation or anyone else," President Trump had said in his State of the Union address. Putin said Russia has now made a 'breakthrough' in this technology, becoming the first nation to bring it to maturity. "In late 2017, Russia successfully launched its latest nuclear-powered missile at the Central training ground. During its flight, the nuclear-powered engine reached its design capacity and provided the necessary propulsion," Putin said. But this is a route that the US had travelled long time back before changing course to building alternatives. Putin also presented a video that showed a how such a cruise missile evades terrain and missile defenses and flies thousands of miles around the tip of South America and toward the U.S. West Coast. Another project the Russians are working on is a high-endurance underwater drone that can dive "really very deep" and travel between continents faster than submarines. In the US, military experts have been clamoring for defensive action against the new cruise missiles under testing in Russia. The new cruise missiles of Russia have "the capability to hold targets at risk at ranges we haven't seen before," Air Force Gen. Lori Robinson told the Senate in mid-February, the Washington Post reported. "Over the past decade, while the United States has led the world in these reductions, every one of our potential nuclear adversaries has been pursuing the exact opposite strategy ... These powers are increasing the numbers and types of nuclear weapons in their arsenal," Deputy Energy Secretary Dan Brouillette said at a Pentagon news conference, the Washington Post reported.